On the same day sleazy Boston talk host Mike Barnicle was fantasizing with Don Imus about hanging Republicans on MSNBC, his low- rated local radio show was being chopped in half! As a part of lineup changes affecting Boston's WTKK- FM, the notoriously sloppy and unethical plagiarist will see his show moved to earlier in the morning and shrunk to just a single hour, according to the Boston Herald. In talk radio, such a cut is equal to being sent to Siberia. It's also a sign that Barnicle probably won't be sticking around beyond the end of his current contract. Here at the Radio Equalizer, we'll shed no tears upon his exit. Does it get any more foul than this? During the 8 AM ET hour of Don Imus's show this morning he and Mike Barnicle fantasized about how various Republicans would react to being hung on the gallows. Imus: "I was – I tried to imagine how various members of the current administration would behave were they subjected to the gallows as Saddam Hussein was. Um, and I can see Rumsfeld –"
Imus: "That's what I was thinking, you know. ‘F-you.' You know, you go to the gallows with the noose you want, not the noose you– or the noose you have, not the noose you want–"
Imus: "Or Whatever. But Cheney–"
Barnicle: "Just as that trap door opens, he'd drop an f-bomb to all of them." Imus: "Now this is a guy who would, this is a guy – he'd wet his pants and he'd whine and start crying." 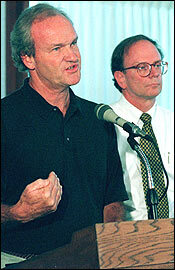 Barnicle: "Well He would order as a last meal 400 pounds of bacon." Your Amazon orders that begin with clicks here, regardless of what you ultimately select for purchase, greatly help to support this site's efforts. Thanks! As a former listener (I moved from Boston) of most of the TKK line-up, I found Barnicle to be generally good when discussing local stories. Additionally, when politics came up, it was actually preferrable to hear Globies from the sports department discussing it than reading most Globe political writers and reporters. Also, I have nothing but admiration for the very hard working Hank Morse, an extremely likeable guy both on and off the air. Having said all of this, I find Barnicle on national politics to be extremely tiresome and cliched. He is especially annoying when he is allowed to let his hair down on Imus. A cross between Tim Russert and Keith Olberman comes to mind after hearing his dopey comments the other morning. Glad to see that Eagan & Braude are getting 3 hours back (and I'm a conservative). 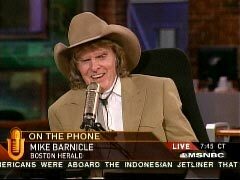 Maybe it's an old shot but did you notice that Imus' show still says that Barnicle is with the Herald?? 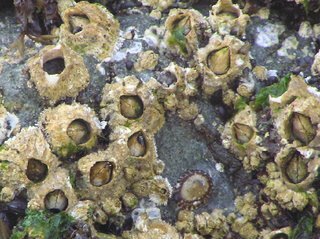 My understanding is that Barnicle volunteered to leave during cutbacks since the family is not exactly short on income streams. That was, however, well over a year ago when I still lived in Boston. It's one thing for the mistake to be made shortly after the fact, but at a certain point he has a duty to correct the record if in fact he is no longer affiliated with the Herald. Certainly the paper has no interest in being chyroned on this latest Imus appearance. Pictures are hung; People are HANGED. Getting down to thirty-six minutes of Barnicle is a good start, but please kill the promos! Getting down to thirty-six minutes of Barnicle is a good start. Just kill the promos!